This year was a big one for Hollerado. They re-released their Record in a Bag, nabbed high-profile opening slots and scored a viral hit with their staggering "Americanarama" video. Now, the group are looking to ensure that 2011 will be just as good, as they have signed on to open for veteran post-punks Gang of Four on their February North American tour. Gang of Four first announced the tour last month, at which point the opener was still unknown. 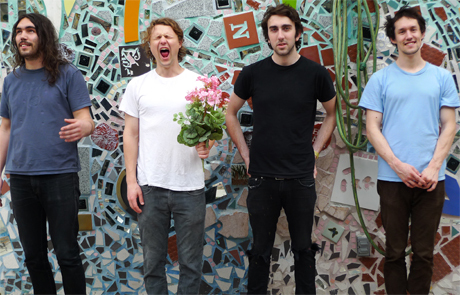 Hollerado are now set for 13 shows, including one Canadian date in Vancouver on February 15. Interestingly, Hollerado won't be opening at the Toronto show, which comes at the beginning of the tour. If you're able to make it out to one of the gigs, be sure to look out for the new Margaritaville 2: The Reckoning at the merch table. Before the Gang of Four tour, Hollerado will be rounding out 2010 with a pair of hometown shoes in Manotick, ON. See the full schedule below.